As part of the world wide Scout movement Joey Scouts have their own uniform. Joey Scouts wear a blue uniform shirt with tan highlight on the collar and sleeves together with navy blue pants or shorts and a belt. They also wear the blue and black 1st / 14th Brighton Sea Scouts scarf, a woggle and badges. 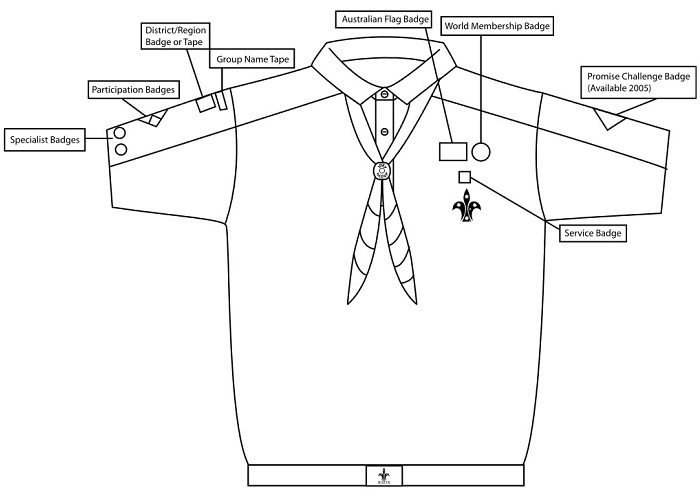 The uniform may be worn before the Joey Scout is "invested" or becomes a member, but the scarf and woggle will only be presented to them at their investiture ceremony and cannot be worn until then. Appropriate footwear also is also needed. Sneakers, sand shoes or other closed toed shoes are good. Bare feet, thongs or crocs are not allowed. Joey Scouts are "Sun Smart" and need to wear a broad rimmed hat or something similar when participating in any outdoor activities. For most meetings at the Scout Hall and excursions the uniform will be worn. Your Joey section leader will let you know if there are activities, such as one where you might get dirty, where you will wear "mufti" or casual clothes. 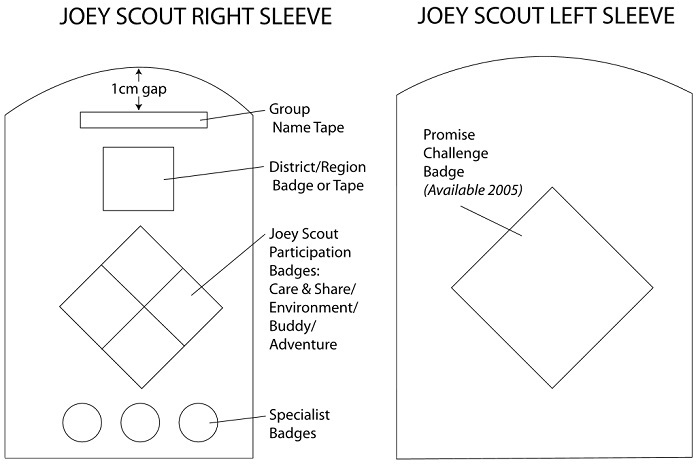 All badges need to be sewn onto the Joey Scouts shirt in specific locations. The diagram below shows the correct placement. 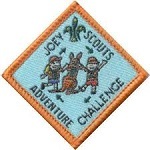 Joey Scouts have a series of challenges aimed at the age group to allow Joey Scouts to strive to earn a badge in a fun, and achievable way. Each of these challenges can be done with their Mob and some of the challenges have sections that you might like to do with your Joey as a family. 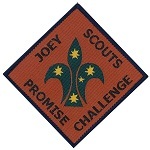 Speak to your Joey Scout Leader about how your Joey can begin the first challenge! Each Mob plans and runs programs for one month that focus on caring and sharing. As a highlight, the Mob does a special deed for the local community. 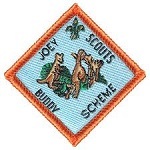 Joey Scout Mobs visit each other, share activities and have great fun. The Mob Buddy Scheme aims at building a rapport and friendship between different Mobs. The Mob undertakes four simple Environmental Challenges that aim to develop an appreciation of and respect for the natural environment, to gain knowledge of Australian plants and animals, and to develop a sense of responsibility in behaviour and action. 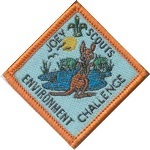 The Adventure Challenge is designed to broaden each Joey Scout’s life experiences through visiting places to which the Mob doesn’t usually go. Some of the adventures could include a trip to the beach or a creek, a bushwalk, visiting a museum or a farm… the possibilities are endless! The aim of this challenge is to allow older Joey Scouts to gain a greater understanding of the Scout Promise and Law, to learn about Scouting’s Founder, Lord Robert Baden-Powell, and to discover the history of Scouting. 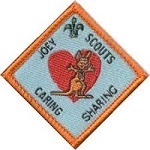 The challenge requires the Joey Scout to complete certain elements, such as research and discussion with their parents and Leaders, away from the Mob meetings. The Joey will also be required to give a presentation to the Mob on completion of the task. Acknowledgment: Information to create this page was sourced from the Scouts Victoria (Scouts Central) website.